Parsippany, New Jersey -- In last week’s column we extolled the virtues of the visionary people who were concerned with the disappearance of traditional Irish music and dance after World War II and took action to reverse the tide before it was too late. Comhaltas Ceoltoiri Eireann had created a fleadh system in rudimentary fashion as a vehicle to encourage young people to learn music and provide incentives for taking on their native music. As we noted, the concept has mushroomed to the point where there are probably more people playing and enjoying Irish traditional music than at any time in its history on both sides of the Atlantic Ocean. Fleadhanna today have become much more than mere music competitions attended by people who embrace Irish music to the core of their being as a vital part of our Irish heritage. That was borne out last weekend at the Mid-Atlantic Fleadh Cheoil at the Parsippany Hilton in New Jersey from Friday to Sunday evening. The weekend got underway on Friday night as the opening ceili for the fleadh weekend featured the invited guests from Ireland, five members of the Shannon Vale Ceili Band, half of the contingent that garnered the Senior All-Ireland Ceili Band Cup in Cavan in 2011. It was reputed that the night before at the New York Irish Center where they made a guest appearance that one of them said they were the better half, but you didn’t hear that from me. That opinion aside, it was a pure delight to listen and dance to the music of Danny O’Mahony (button accordion), Colm Kissane (fiddle), Joe O’Sullivan (flute), Michael Collins (banjo) and Patsy Broderick (piano). They would be part of a 14 member adjudication panel on Saturday and Sunday, adding some expertise with the All-Ireland adjudication process which is always helpful when so many competitors from here aspire to go over to the All-Ireland fleadh. The competitions began in earnest on Saturday morning with all the solo competitions and grupai cheoils to be dealt with. According to fleadh secretary Terry Rafferty, who has been handling the fleadh registrations and office for 24 years, it was one of her busiest weekends ever. 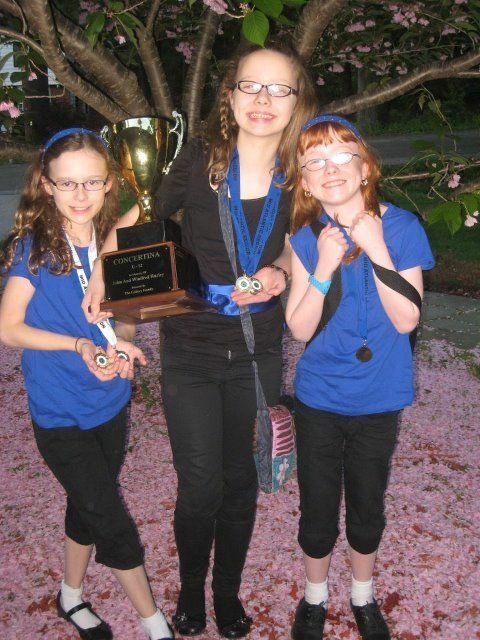 Triplets Mairead, Caitriona and Angel Fee had a big day in Parsippany. Entries were over 350, with folks coming from as far west as California, south to Georgia and north to New England to see if they could place first or second and earn the right to qualify for Fleadh Cheoil na hEireann. Most of the competitors would come from the metropolitan New York area through the Pearl River School of Music, Acosta School of Irish Music and dance and the Woodlawn School of Music. The duets, trios and ceili band competitions all took place on Sunday which was Mother’s Day as well, so it was a real testament to the commitment of the parents who invest so much time, energy and money into passing on the tradition to their children. The bloom of youth was very apparent in all the age brackets but was especially impressive in the youngest category of those under 12 years old. 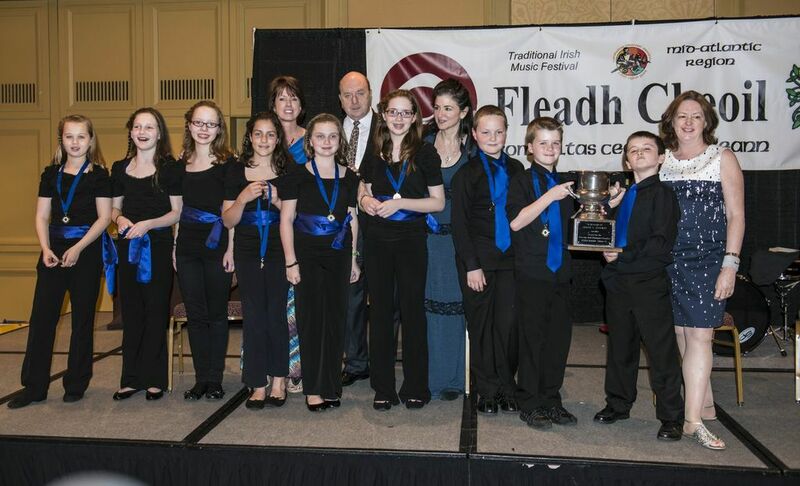 Whether they were encouraged by the under-12 Pearl River Ceili Band last year winning first in Parsippany and then going on to achieve All-Ireland gold in spectacular fashion in Cavan last August, they fielded eight ceili bands this year in the competition and 81 solo competitors. There were 18 ceili bands overall which is not only significant in developing teamwork among the young musicians that reinforces their solo, duet and trio work, but also forges strong bonds of friendship among these developing musicians. It is also indicative of a very healthy era for traditional music and forecasts a promising future as well. One of the Irish adjudicators, Danny O’Mahony, made a special point at the Sunday ceili band competitions to say that the values of teamwork inherent in ensemble playing were very important, but that they also lead to building friendships which would remain for life -- true of his own experience as a musician and band leader. It may very well lead to a bumper crop of young musicians heading to the historic Fleadh Cheoil na hEireann in Derry City this August (www.fleadhcheoil.ie) and the summer school (Scoil Eigse) where first and second place winners receive a scholarship for tuition and the All-Ireland competitions. All of that will certainly enhance Tourism Ireland’s statistics from America in the year of The Gathering as parents, siblings and proud grandparents often swell the numbers. Since many of these children may be experiencing a trip to Ireland for the first time, the chance to engage with children from Ireland or Britain leaves a great first impression and a fondness for the old sod that only magnifies with each visit thereafter. When the New York Fleadh moved from Pearl River three years ago to the Parsippany Hilton under the impetus of the now provincial chair for CCE North America Tom Vesey, the primary attraction for those not involved in fleadh competitions has been the Saturday night banquet where the annual Mid-Atlantic Regional Hall of Fame Inductions occurred. This year three outstanding musicians were honored for their contributions to strengthening Irish music appreciation in the area. A posthumous induction for the late Jerry Lynch of Clogher, Kilfenora who passed away in 2011 recognized his legacy while living in New York. A member of the first senior ceili band to win the All-Ireland three years in a row when the Kilfenora Ceili Band won in 1954-‘56, he returned permanently to Ireland in time to coach the second Kilfenora Ceili Band to do the three peat in 1993, 1994 and 1995. While in New York he played a lot of Irish music with the Jerry Lynch Trio and later as a member of the Killoran Clancy branch based in Queens. His wife Betty came over for the ceremony and sang a song at the banquet, and his daughter Tara played the accordion after the presentation was made. Patty Conway Furlong also received one of the beautiful crystal bowls made by Bill Healy Crystal in New Jersey for her work on behalf of traditional music in New York. Born in the Bronx, she eventually took up the box and blossomed early under the masterful tutelage of Martin Mulvihill, winning an All-Ireland title in 1975 on solo accordion and in 1978 in a trio with Gail Mulvihill and Peter Wynne and with the Glinside Ceili Band. In 1999 she recorded a solo album, Traditional Irish Music on Button Accordion, and played in the bands Atlantic Bridge, Coolmagort and the Pride of Moyvane. She has taught button accordion for almost two decades and is currently one of the three teachers in the Pearl River School of Music and a key person in Irish music education in the U.S.
Rose Conway Flanagan’s induction added a new first to a stellar Hall of Fame lineup, being the third member of her family to join it following her father Jim (1996) and brother Brian (2006). Her Bronx home was a sanctuary for fiddle players in New York to share tunes on a Friday night, and the Sligo New York style soon became her forte as well as Brian’s, and one she is associated with as one of the country’s foremost fiddle teachers. She is greatly in demand at Irish music camps and ceilithe with her Green Gates Ceili Band. In their remarks to the banquet audience Patty and Rose spoke eloquently of the importance of Irish music in their lives and the bonds it brought them in friendship and even marriage to their husbands Kevin Furlong and Michael Flanagan. Their induction this year along with that of Margie Mulvihill and John Reynolds last year symbolized the importance of the fleadh fellowship and reverence for Irish music that was handed down to them by their parents and burnished by their own teachers like Martin Mulvihill and Pete Kelly. Their handiwork and that of all the previous Hall of Fame people was really being played out all weekend long at the Parsippany fleadh as the living tradition was palpable as sessions dotted the interior hotel spaces. A great late Saturday night singsong erupted in the hospitality suite with many voices coming together as part of the cultural celebration that is the fleadh.